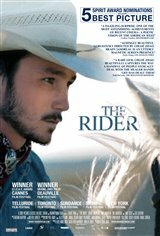 Brady Blackburn (Brady Jandreau) is a gifted young horse trainer and bronc rider whose rodeo career is cut short when he suffers a near fatal fall during a competition, sustaining a major head injury. Fitted with a steel plate in his head, his doctors advise that he should never ride again. Brady tries to follow that advice, and sells his beloved horse, Gus. Brady's friend, Lane, has also suffered a life-changing accident, with much worse injuries — he has severe brain damage and is permanently paralyzed. Brady gets a job at a local supermarket, telling himself that he'll be back in the saddle before long. As Brady improves, he's slowly drawn back to his beloved horses, knowing he can never live a life that doesn't include them. Based on Brady Jandreau's true life experiences. Most of the people in the film are playing fictionalized versions of themselves.